Three years ago Alex Polizzi featured the African Queen floating hotel in her Channel 5 programme Hotel Inspector. This Thursday 6 September (9pm) Alex goes aboard again to see if owners Andy and Bonny Cowley have built on her makeover suggestions. The Dutch barge’s home mooring is Mapledurham. 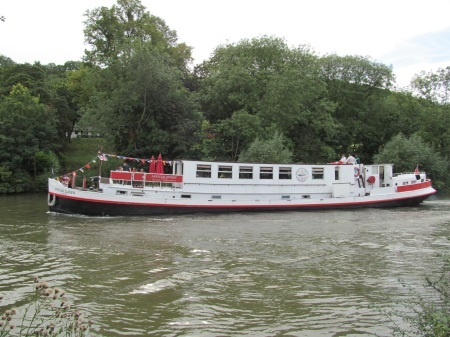 Last weekend it was seen sailing downstream from Goring although it can only just get under Whitchurch Bridge.